This is my third post regarding the Deuteronomistic History (DtH). The first one introduced the Book of Deuteronomy and its relationship with the rest of the historical books (Joshua – 2 Kings) of the Deuteronomistic narrative. The introduction to the reading of the Books of Joshua and Judges was the goal of my second post. Here now I have collected a few guidelines for the Books of Samuel. The books of Samuel were originally only one book in the Hebrew Bible. They were split into two books at quite a late date, as reflected in the Septuagint and the Vulgate translations and gathered together with the Books of Kings as 1-4 Reigns (also 1-4 Kingdoms). 1 and 2 Samuel present a lengthy narrative from the end of the Judges era to the consolidation of the Israelite monarchy. Nobody knows clearly by who or when these books were written. However, the Babylonian Talmud (ca. 6th century CE) identifies Samuel as the composer of the texts before his own death. Later on some other prophets (like Nathan and Gad, cf. 1 Chr 29:29) wrote the rest of the work. Well, many modern experts are in agreement that 1-2 Sam were written by anonymous authors as part of the larger composition of the DtH. Therefore various edited traditions seem to be found in these narratives. The first book begins with the story of Samuel: his birth from a barren woman (the same motif as in the Samson narrative from Judges 13:2-5), his call by YHWH in the sanctuary of Shiloh and his early exploits (1 Sam 1-7). Samuel is introduced as a the first prophet of YHWH as well as the last judge in Israel. He is largely involved in the different stories about the appointment of Saul, Israel’s first king (1 Sam 8-12 offers several different accounts of how Saul rises to kingship). Samuel’s final discourse in 1 Sam 12 marks the end of the period of Judges and the beginning of the monarchical era. This key speech provides a summary of the events from the exodus, the entrance in the land, the time of the Judges and the origins of the monarchy. It also provides some clues for the understanding of the subsequent history, especially by alluding to the possible failure of kingship and the tragic end of the people. As a matter of fact, this failure already appears in the story of king Saul. Despite his relative success at war (1 Sam 13-15), the king is rejected by the LORD who, meanwhile, has changed his mind and chosen David. The divine choice of David from Judah against Saul from Benjamin symbolizes then the legitimization of the Judean, Davidic dynasty against the Northern monarchy. Two important narrative cycles are devoted to David in these books. 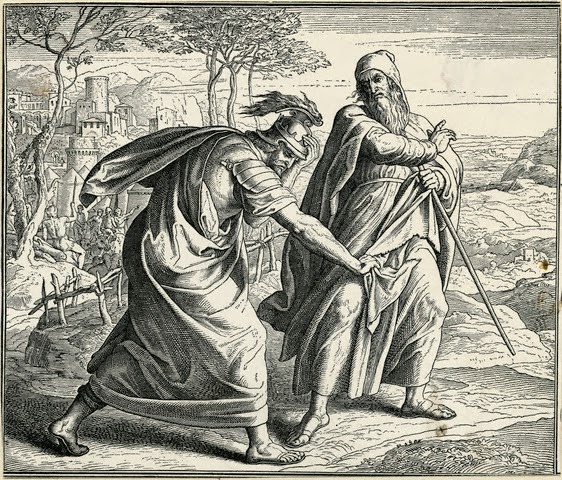 The first, which is often called ‘the Story of David’s Rise’ (1 Sam 16-2 Sam 5), relates the beginning of David’s career, his conflicts with Saul, as well as the allegiance of Saul’s son, Jonathan, and of his daughter, Michal, to David. 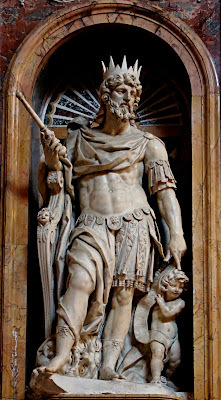 This cycle brings together various traditions about David, from his arrival to the court to YHWH’s promise to David of a dynasty that will be established for ever on Israel’s throne (2 Sam 7). Nonetheless, David’s depiction in the following cycle (2 Sam 9 - 1Kgs 2) strongly contrasts with his presentation up to this point. In this narrative usually called the ‘Succession to the Throne of David Story’, David often appears as a weak king, and even as morally incorrect. The story of the succession comes to an end in 1Kgs 1:1-2:13, after an interruption in 2 Sam 21-24 (these chapters from an appendix; in the last chapter David is presented as the founder of the future temple, 2 Sam 24). In 1 Kgs 1, Solomon rises to the throne as the result of an intrigue led by Nathan and Bathsheba, whereas David appears as old and utterly invalid, without any capacity to control the events. Many scholars agree that the Books of Samuel are considered a literary “masterpiece”. The intricate plots, the complexity of the characters, the richness of the dialogues expressing feelings and emotions, the abundant use of wordplays and other literary devices show up as a clear sign of a well thought and elaborate composition. There is also strong agreement among the experts that some of its accounts may contain or reflect some factual history, even though the book was composed probably centuries after the narrated events occurred. There are several strong theological themes throughout these books that reveal the Deuteronomistic background of these accounts and also foretell how the Israelites will perceive and assess their kings. The concept of the LORD’s covenant appears again as a depiction of God’s relationship with his people. God is the great king and Israel his vassal (1 Sam 4-7). The narration of Israel's community asking Samuel for a king who will defend them (1 Sam 8) seems to foreshadow that unfaithfulness which will become a normal attitude for the Israelites as later the literary prophets will denounce. As we go over the story of the first rulers of Israel, its writers seem to argue for YHWH’s supremacy over his people while defining the role of the human king . The king’s obeisance to the LORD’s statutes is mandatory to keep his blessings over him and his people (cf. 1 Sam 10:1;15-16; 2 Sam 5-7, 12-19). Related to this idea is that one of the Davidic dynasty. The kingship of Israel should be able to fulfill certain criteria. All kings in Israel should be as Samuel determined (1 Sam 15:22-23). From David on, all the kings must fit in with what was determined by the Law (Deut 17: 14-20). Consequently, these texts will be of great influence through the rest of the kings’ accounts even to Second Temple Judaism times. The Davidic covenant is crucial in the Books of Samuel (2 Sam 7). The relationship between YHWH and King David is built and fostered by the prior covenants (Noah, Abraham, Sinai) and it will remain until the NT times (Jesus, son of David). However, this promise of a permanent royal posterity is marred by the events of 2 Sam 11. David's grave mishap with Bathsheba and the weakness of character towards his children (as they appear in the narrative), make stark contrast with the demand of being a loyal and blameless king. This dialectical theme will remain in the narratives until the end of the DtH and will be well remembered by the Prophetic Literature (Am 9:11-12; Isa 11:1-2; Jer 23:5). to reestablish a proper relationship with the LORD. This subject works in the Samuel narratives in several ways. 1 Sam 7:2-6 portrays the need for Israel to not only repent but to turn to YHWH with all their hearts and loyal devotion. With King Saul, however, this theme is viewed in the opposite way. Although he was given the opportunity to repent after falling short with YHWH, Saul was not willing to follow Samuel’s indications or to be perceived as vulnerable neither by the prophet nor his people, persisting in his own interest (1 Sam 15: 7-31). As a difference, when king David acknowledges that he has sinned, he does it with a true spirit of repentance (2 Sam 12:13). This confession and return to the LORD is in consonance with what was proposed by Samuel to God’s people (1 Sam 7), making David recover YHWH’s favor. Samuel, as I mentioned above, is considered the last judge and the first Israelite prophet. The Deuteromistic authors take pain in conveying that Samuel and the prophets of 1-2 Sam are the examples of Israelite prophecy for those who are to be called to the same ministry. The prophet should make sure that YHWH’s people is taken care of by reminding Israel’s rulers the statutes of the Law and overseeing the institution of the monarchy. As a reminder, the books from Joshua to 2 Kings are considered as the ‘Former Prophets’ (נביאים ראשׁונים ; nĕvî’îm rišônîm) in the Hebrew Bible. The LXX and most English translations allocate the Books of Samuel in the Historical Books section.